Finding both a fossilized drag mark and the fossil of the creature that left it is exceptionally rare. An ammonite fossil discovered in the late 1990s in the Upper Jurassic limestone of a quarry near the village Solnhofen in Bavaria put even the rarest of its brethren to shame by leaving a fossilized drag mark an unheard of 8.5 meters (28 feet) long. All the examples of ammonite drag marks found before this one were less than one meter in length. The ammonite in question (Subplanites rueppellianus) was dead and drifting when it left its final testament: multiple continuous parallel lines dug into the sediment of what was then the sea floor by the ribs of the shell. At first glance, it’s not a terribly impressive specimen. A sub-adult male, it’s comparatively small at 114 x 101 mm (4.5 x 4 inches) and poorly preserved. It was damaged when it was collected; there’s a crack running through it, and a separate fragment was reattached during restoration. The little guy’s drag mark, on the other hand, is in excellent condition. It was recovered in multiple pieces and put back together. Its dramatic length isn’t even complete, because the spot where the ammonite first began to drag along the sediment did not survive. 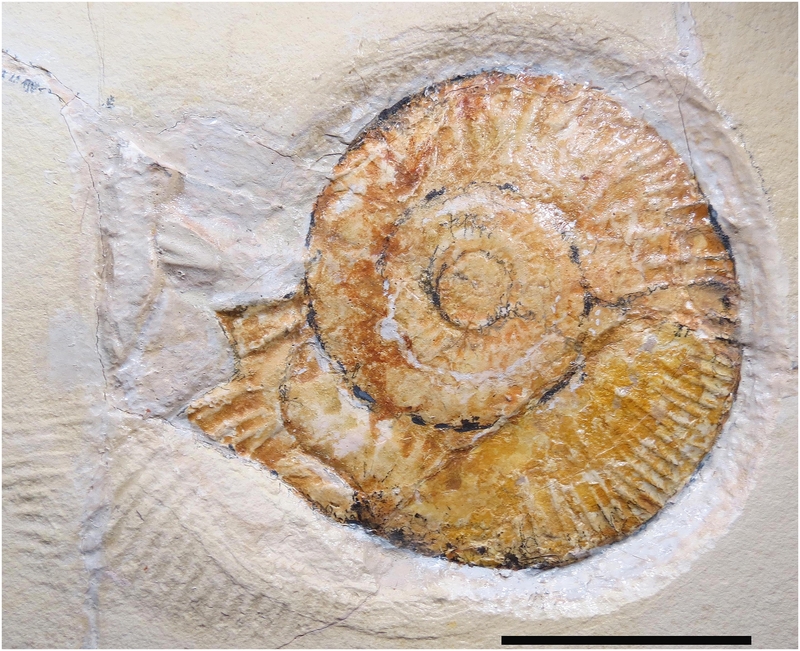 Based on the depth of the furrows, researchers believe the ammonite started off buoyant courtesy of the gases in its shell generated by the decay of the dead animal. The drag marks start off light, then get deeper as the gases wear off and the ammonite shell drops lower onto the top layer of carbonate mud substrate. The preserved start begins with two prominent ridges, with a single furrow. Here, the mark width measures 5.7 mm. From this point, the drag mark width was measured at approximately every 50 cm (Table 1). At one metre, additional ridges created by the ribs of the ammonite appear in the substrate, but they are faint and poorly preserved. Noticeably, at 1.7 m, an additional three ridges are present but disappear again. Four ridges appear consistently from around 2 m (Fig 1), until about 6.5 m, where five prominent ridges appear. At approximately 7.5 m, only four prominent ridges can be seen, but beyond this point the drag mark preserves five very prominent ridges. It is not until the drag mark is nearly terminating, at 30 cm anterior to the ammonite, where six ridges are present and prominent. At 3 cm from the ammonite, the number of ridges increases to 11, showing that more of the ammonite is clearly in contact with the substrate (Fig 3). Here, the orientation of the ridges turns from being parallel to the long axis of the specimen to almost perpendicular to it, and increase in number to 18. Here, the ridges and furrows in the substrate mirror the spacing of the ammonite ribs that are well preserved, indicative of a touch down mark (Fig 3). The shell was likely bounced along the substrate by currents and waves, not by another animal. The exceptional length of this drag mark indicates a very stable, calm current that was steady enough to keep the ammonite shell moving without tumbling or excessive rotating while not disturbing the sediment on the sea floor. A digital model of the full surviving drag mark has been created using photogrammetry, a high-resolution composite generated from 645 photographs. And thus the ammonite with his epic drag mark, already preserved by fossilization, achieves digital immortality as well.